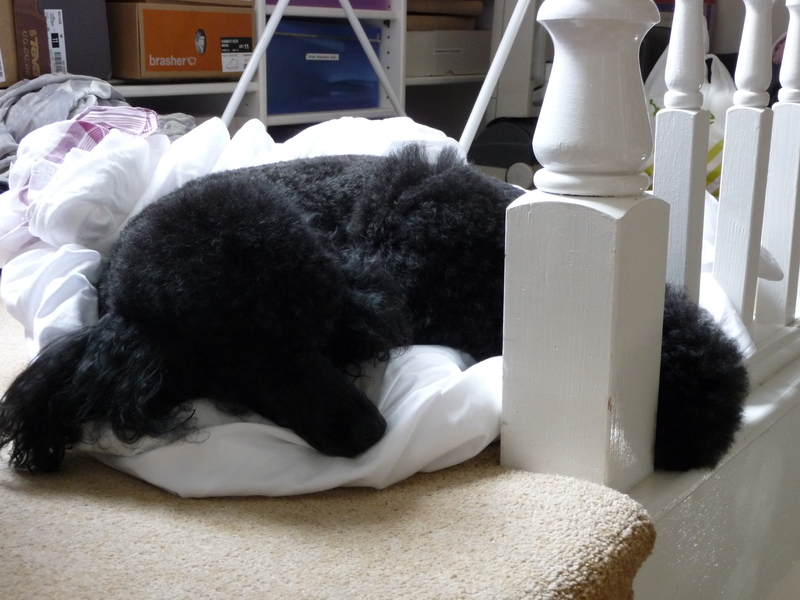 Take the sheets off the bed and leave them at the top of the stairs while you strip the rest of the beds and come back to find a poodle snuggled down in the sunshine for a quick forty winks. This entry was posted in Poodles on 17/05/2011 by Joanna. Nice to see you back, Joanna. Have you got your new computer sorted out now? Greetings Joanna. So pleased to see you up and about. Love the picture of Zeb – pure peace, literally. Am about to jog (not literally you understand) out the door and off to work – hey ho. Smart dog. Who wouldn’t want to do that I say?…actually I could do 40 winks in the sun right now. Hi to you too Abby! Lovely picture- almost a B+W with the white sheets and black Zeb! I missed you, too, thanks for keeping in touch in comments! I took an unscheduled nap around 4 PM- I sat down for a moment and my husband woke me up when he came home at 6:15! Yawn- I’m still tired. Now if only we had some sunshine. Re. Zeb – there’s more going on there than you may think – he’s not just taking a quick nap on a nearby soft spot, he’s renewing his relationship with the members of his pack, and most interestingly, your aromas are the key element to that relationship. But I bet you already know this. I’ve missed you. Welcome back and with such a lovely picture – I always love to see what Zeb is up to! Thanks Ann! I’ve missed you all too! Now I am envious, even though the Lake is open it is still too cold for me to brave going in, I hope it warms up properly soon here too Gina ! Zeb has a hard life. I’d be worried about the black dog hairs normally. But having met Zeb, I would be wrong. No cats here – though there is a tailess one who visits and gets ‘bounced’ by the dogs along with the foxes and the squirrels and so on…. I’ve always wanted a standard poodle, such intelligent creatures! Zeb seems to be very happy, and a very good companion! Hope you are well on your way to posting more soon! The sheet thief is 15 cms from floor to shoulder – he’s a mini – standards are great too!